Salmon Arm Bay . . . western grebes, shorebirds, waterfowl, raptors and songbirds. Best viewing of western grebes is from April to October. Shorebird viewing best from March to November. Access by paved road. Adams River/Haig Brown Provincial Park . . . spawning sockeye salmon, raptors, coyotes, mink and black bear. The famous Adams River Sockeye spawn every four years during the months of September and October. Access by paved road. Tranquille Wildlife Management Area . 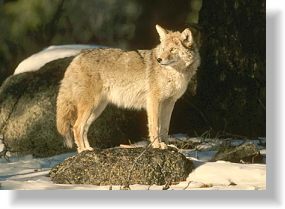 . . waterfowl, raptors, songbirds, shorebirds, bighorn sheep, mule deer and coyotes. Birdwatching best during the months of March, April, May, September, October and November. Mule deer seen in April, May and June. Access by paved road. South Thompson River . . . swans, ospreys, waterfowl and bighorn sheep. Best viewing months for ospreys are May, June, July and August. Swans and other waterfowl can be seen from October through to May. Access by paved road. Bridge Creek . . . spawning rainbow trout and kokanee. View spawning rainbow trout during the month of June and kokanee during the month of September. Access by paved road. Wells Gray Provincial Park. . . moose, black bears, mule deer, caribou, wolves, beavers. grizzly bears, raptors, songbirds and chinook salmon. Best viewing months for black bears are May, June and October. Moose can be seen year round. The months of August and September are best for viewing chinook salmon spawning. Access by paved road. Mount Robson Provincial Park . . . waterfowl, raptors, songbirds, moose, elk, deer and black bears. Good viewing of all animals and bird species are the months of May to October. Access by paved road. Cranberry Marsh . . . muskrats, moose, mule deer, waterfowl and raptors. Wildlife viewing is from April to the end of September. Access by paved road. Rearguard Falls Provincial Park . . . spawning chinook salmon. Viewing during the months of August and September. Access by paved road and walk in.